Naturally (herbs, flowers) scented teas from north Thailand. Oolong tea from north Thailand’s native Assamica tea tree, naturally scented with local “sticky rice” herb (chin. 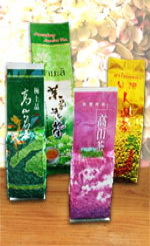 “Nuo Mi Xiang Nen Ye” = “sweet fragrance rice tender leaves”). Through the addition of the aroma donor during processing, the tea leaves obtain an intense rice flavor, making them unique regional tea specialty. The sated yellow to golden brown cup reveals a complex and multifacetted flavor combination of Oolong tea notes and rice aromas. The tea basis of our Jasmine-scented green tea from Doi Mae Salong, north Thailand, are leaves of the native “Assamica” tea tree. These are scented through the addition of jasmine blossoms and jasmine essential oil during processing. The jasmine fragrance clearly dominates the scent of the intensely yellow cup. However, in terms of taste, this tea has even more to offer. To this end, Bai Yai Xian Pian Jasmine Tea combines the characteristic floral note of the jasmine blossom with the fresh taste of green tea. Cha Khao Hom Thai Rice Tea Premium – 100% naturally scented Jin Xuan Oolong tea; exclusive Thai tea specialty from Doi Mae Salong, north Thailand; harmonical combination of fine Thai Jin Xuan Oolong tea and the natural aroma donor “Nuo Mi Xiang Nen Ye“ (=”sweet fragrance rice tender leaves”). Fine, low-oxidized Thai Oolong tea, naturally scented with Osmanthus blossoms. The clear, bright green cup’s smooth, flowery-fresh scent already hints at this Oolong tea specialty’s complex taste pattern. In the perfect flavor match, the aroma donor complements the genuine taste of the Oolong tea in a decent way, i. e. without dominating or even replacing it. Altogether, DMS Gui Hua Osmanthus Oolong combines round smoothness with soothing unobtrusiveness and luxurious wealth. Oolong Ginseng Tea from Doi Mae Salong, north Thailand, produced according to the ancient Chinese Oolong Ginseng processing method.